During the 1950's Cunard added four new, almost identical liners to their passenger fleet. Characterised by their distinctive domed funnels, Saxonia, Ivernia, Carinthia and Sylvania were all products of John Brown & Co Ltd, Clydebank. They were built for the St Lawrence routes to Quebec and Montreal in Canada, initially sailing from UK home ports of Southampton, Liverpool and Greenock. Fourth in this quartet of sister ships, Sylvania was also the last ever Cunarder designed exclusively for North Atlantic trade. Launched in November 1956, she entered service in the summer of 1957 with Liverpool and Greenock her British ports. She maintained a reliable and regular service to Canada until 1961, then transferred to the New York route as replacement for the retired ex-White Star motorship, Britannic. In 1965 Sylvania began a new role as a Mediterranean cruise liner sailing out of Liverpool, then Gibralter. Two years later she emerged from refit sporting a white hull and her own hovercraft for fast tendering. As with her sisters, Sylvania's primary career proved short-lived, the viability of her transatlantic passenger-carrying role having been quickly eroded by jet air travel. 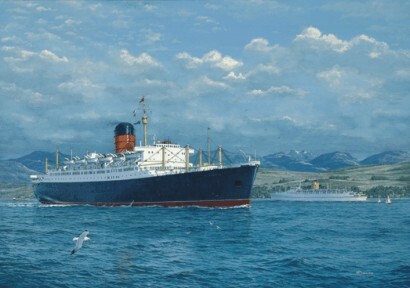 Parting company with Cunard in 1968, her useful life was far from over, however. As the Albatross, she was still operating in the Bahamas at the time of writing (2000) - a truly remarkable career, by any standards. The equally handsome Empress of Britain was built in 1956 for Canadian Pacific by Fairfield shipyard, Glasgow. Slightly larger than Sylvania, she too, with her sisters, Empress of England and Empress of Canada, was designed and built to operate between the UK and Canada. In this finely detailed painting, Gordon Bauwens recalls a childhood memory as the rival liners pass on their river of birth. In the distance, the paddle steamer Waverley, in Caledonian Steam Packet colours, completes this highly nostalgic early 1960's scene, set amidst a lively Clyde panorama. 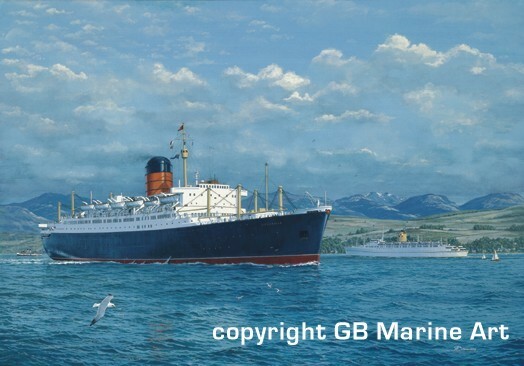 From an original painting featuring 'Sylvania' and 'Empress of Britain' by Gordon Bauwens. Limited edition of 850 individually signed and numbered fine art prints.